Almost 50 years ago, John McCaffery was one of those who presented the 1972 and 1978 Māori Language and Broadcasting Petitions to Parliament, asking for active recognition of te reo Māori, radio and television and bilingual schooling. 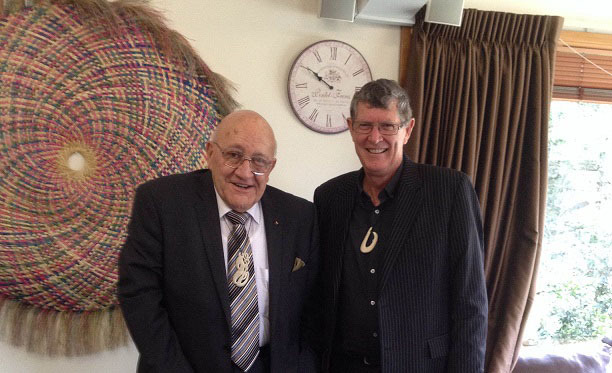 Since then, he has been heavily involved in teaching, researching and advising schools, organisations, government departments and Pacific Nations on bilingualism, Bilingual Education and biliteracy and was a founding member of Te Reo Māori Society Aotearoa. Now as an Honorary Academic and researcher at the University of Auckland, the former teacher and senior lecturer spends much of his time researching bilingualism, biliteracy and using his research to advocate for a bilingual Aotearoa New Zealand. He spoke to Danielle Kutchel about the progress Aotearoa is making towards that goal. John McCaffery, right, and Sir Tipene O’Regan, his lecturer and mentor.